Nels J. Nelson was sixteen when the Wright Brothers flew at Kittyhawk, North Carolina, in 1903. Eight years later he was building his own airplanes in New Britain, Connecticut. His first airplane made its maiden flight over Plainfield, Connecticut, May 1st, 1911. Nelson took to giving flying exhibitions which were well received by a public eager to see what those “new fangled flying machines” could do. 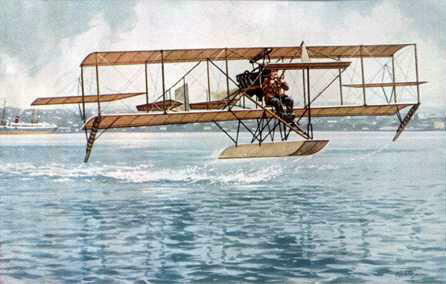 By 1913 he’d developed what he called a “Hydroplane” capable of taking off and landing in water. On July 1, 1913, Nelson flew his Hydroplane over Providence, Rhode Island, where he circled the area of Exchange Place and City Hall twice before making a turn around the dome of the state capitol. From there he flew south where he landed in the water just off shore from the famous Rocky Point Amusement Park in Warwick. The purpose of the flight was to generate interest in several flying exhibitions he was to give at Rocky Point as part of the 4th of July celebration festivities. Advertisements of his arrival had been posted in local papers for several days. On the second flight of the day Nelson took 21-year-old Irving Tukey aboard as a passenger. The take-off went smoothly and the flight was uneventful until the aircraft was returning to land. As Nelson was making his final approach, he cut power to the engine in anticipation of gliding down to the water, but at that instant, a strong gust of wind caught the plane and sent it into a sharp down-turn into the Narragansett Bay from an altitude of 60 feet. Tukey suffered a broken wrist, a laceration to his forehead and numerous bumps and bruises. Nelson was battered and dazed, but otherwise alright. Both men were rescued by a private boat that was anchored nearby watching the festivities. What became of Nelson’s hydroplane isn’t recorded, but the accident didn’t deter him from further flying. The following September he flew another plane that he had built from New Britain, Connecticut to Chicago, Illinois. Mr. Nelson died in 1964 at the age of 77. Many of his fellow aviators never reached middle age. His interest in aviation continued throughout his life. Between 1903 and 1964, (the span of 61 years), he had witnessed the birth of the airplane, the jet, the rocket, and manned space flight.